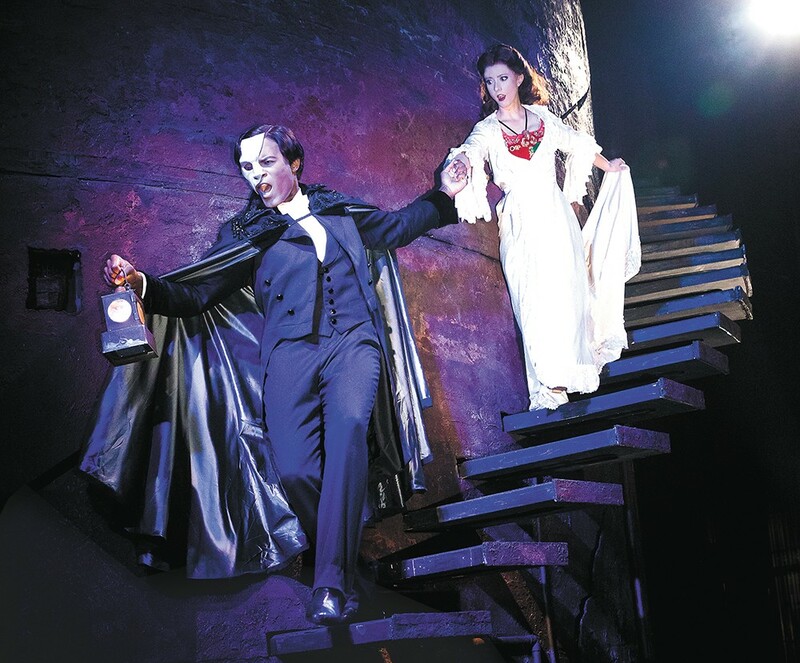 Lead Derrick Davis is confident that the current touring version of The Phantom of the Opera is a can't-miss show. Actors might be expected to lavish praise on their latest show, especially during the press rounds as part of a massive national tour. So it is with Davis, currently playing the enigmatic masked lead in Cameron Mackintosh's revamped, supercharged production of Phantom, which is scheduled to run at the INB Performing Arts Center as part of the Best of Broadway series starting next Wednesday. With Davis, though, the praise comes across as far more sincere than naive or dutiful. When he concludes 20 minutes of superlative-packed descriptions with the admission that his "only regret is that sometimes [he] would love to sit in the audience and watch it," there's little hint of the usual promotional hyperbole. Just to dispel any doubt, he closes by doubling down on his endorsement: "I'm the type of person who doesn't like my time or my money wasted, and I'd dance around it beautifully if I didn't think this Phantom was worth the money or the time. But I am telling you that it is worth it. It is so worth it." Davis' unabashed enthusiasm for Andrew Lloyd Webber's larger-than-life 1986 musical about genius, love, ostracism and self-loathing doesn't just stem from the nostalgia of seeing it as a young child — although that shouldn't be discounted entirely. "It was the first show my parents took me to see, and so I fell in love with the brilliant original production on Broadway," says Davis. "To step into the iconic, titular character is just mind-blowing to me. I try not to think about it too much, because it is an overwhelming thought." "I am all the more in love with this production. The score and script are exactly the same, so people who are Phantom lovers will come and get exactly what they expect. But as far as the content of the production, this one is grittier, it's steeped in more realism, the characters come to life in a way that is so incredibly mind-blowing and so stirring. "And in the 30 years since the show's inception, technology has moved forward. This show brings everything very current, as far the sound and lighting design and the pyrotechnics. All of it is so breathtaking." Some of those technological advances went directly into the famous chandelier. The pendant 1,500-pound centerpiece in this show is by all accounts a marvel of theatrical design and engineering. Fog and lighting have been carefully integrated into its structure, and its pyrotechnic capabilities require 30 minutes of prep before every show. When it falls, it plunges at a rate of 10 feet per second. Yet no amount of glitz will make up for a show that's thin on substance and humanity, something Davis is quick to acknowledge. "In a musical of any kind, really, you have the spectacle that can overtake it. Even the music can become the focus of the show," he says. "But the brilliance of [director] Laurence Connor [is that] we don't rehearse with him on stage. We rehearse with him inside a studio space. He'll take full songs and tell us that we're speaking through the text. No music playing, take it out of the timing, and just make it live as dialogue between people." This isn't a new experience for Davis. During his previous role as Mufasa in The Lion King, a show that used extravagant costumes and Balinese movements to tell its story, director John Stefaniuk would "strip it completely bare" during rehearsals. "We would sit and rehearse at a table to make sure that the story is being told. Because if the story's not being told, people aren't being moved to that deep soul level that makes a show last for 30 years. If people are emotionally moved and you crack on a note, they're not going to care. But if all your performance is, is about the singing of the song, then if you crack you've destroyed it all. "Granted," he adds with a basso chuckle, "we shouldn't crack." And just as The Lion King and the original Phantom of the Opera each made Broadway history, Davis reasserts without reservation that this Phantom is history in the (re)making.